It’s all kicking off between Roy Keane and Sir Alex Ferguson currently, and not for the first time. Out of context, it’s tempting to blame their recent spat on Keane’s inherently hostile nature, but to reach such a conclusion is to overlook one of our former boss’ key characteristics: he too sure likes a good fall out. Indeed, several former United players would have responded with a wry smile to Ferguson’s recent claim that one of the key secrets to successful management was “to never hold a grudge – it’s very important”. His feuds with his own players would go on to define his Old Trafford reign. Here are five of the most significant. A sustained relationship between power-obsessed Ferguson and a player who liked to refer to himself as “the Guv’nor” was never going to end happily ever after. After a consistently tempestuous relationship, Ince, who captained United to their first Premier League win in 1993, allegedly fell out beyond repair with Ferguson following United’s 4-0 defeat to Barcelona in 1994. His eventual sale was proof that Ferguson was unafraid to move on big-name players, a characteristic which would become one of the ultimate hallmarks of his Old Trafford reign. Ferguson later condemned Ince as a “big time Charlie”. Ruud’s goalscoring feats mean he will go down as one of the most prolific strikers to ever grace the Premier League. Yet the Dutchman left the club in acrimonious fashion in 2006 after anther fallout with Fergie, who dropped him for the League Cup final and a host of consecutive league matches, including a match against Charlton for which van Nistelrooy refused to even sit on the bench. The striker also fell out with United’s great young hope Cristiano Ronaldo, whom he allegedly told to “go crying to your daddy” – referring to assistant Carlos Quieroz – just months after the Portuguese star’s real father had passed away. He was shipped out to Real Madrid for €24 million at the end of the season. 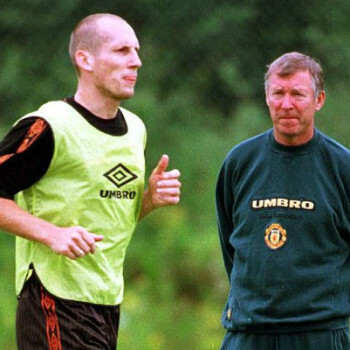 One of the most accomplished defenders of the Ferguson era, Stam was sent off to Lazio in 2001 after three magnificent years at the heart of the United defence. Ferguson was outraged by claims Stam made in his autobiography that when signing the player, United had approached him without first contacting PSV Eindhoven, his previous club. As Stam’s replacement, the 36 year-old Laurent Blanc, struggled to impose himself in the Premier League, Ferguson gradually realised his error and later admitted he had made a serious mistake. The Dutch defender was arguably not adequately replaced until the arrival of Nemanja Vidic in 2006. Surely the highest profile fallout Old Trafford has ever seen. Throughout their time at United, Ferguson increasingly struggled with Beckham’s transformation from young prodigy to leading global celebrity. The feud came to a head during half time of an FA Cup tie with Arsenal in 2003, when a fierce argument prompted the manager to kick a stray boot at the winger, which struck him just above the eye. The wound required stitches, a development which the player certainly made no attempt to hide in subsequent public appearances. After being left out of several high-profile matches, Beckham left the club for Real Madrid at the end of the season, a sad end to a career which the winger had dedicated to the Old Trafford club. This fractured relationship between two of modern football’s most fearsome and stubborn personalities has recently once again reared its ugly – and thoroughly entertaining – head, after Keane responded to claims Ferguson had made in his recent autobiography. Ferguson’s leader on the pitch for a large proportion of his time at Old Trafford, Keane first began to irk his manager after complaining about the conditions at a pre-season training camp. Their relationship suffered an irreparable setback after Keane gave an interview to MUTV following a 4-1 defeat to Middlesbrough in 2005, during which he laid into the likes of Rio Ferdinand, John O’Shea and even Edwin van der. “It seems to me at this club you have to play badly to be rewarded,” he argued. Just two weeks later, United had paid up Keane’s contract in full. 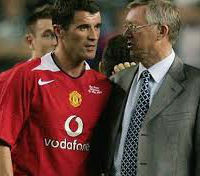 Unlike with Beckham, Ferguson has never resolved his relationship with Keane. Instead, their dispute appears to have permanently tarnished one of the most influential relationships in Manchester United’s history. Previous Article← Will United be heroes or Villans this weekend?